Even today, she's still a looker. And, when I got her, has an aftermarket Kenwood Single DIN radio/CD/MP3/iPod player. 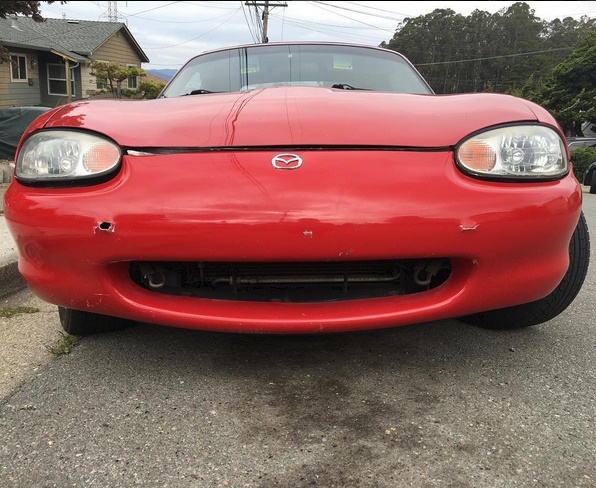 It’s hard not to smile when she smiles back. 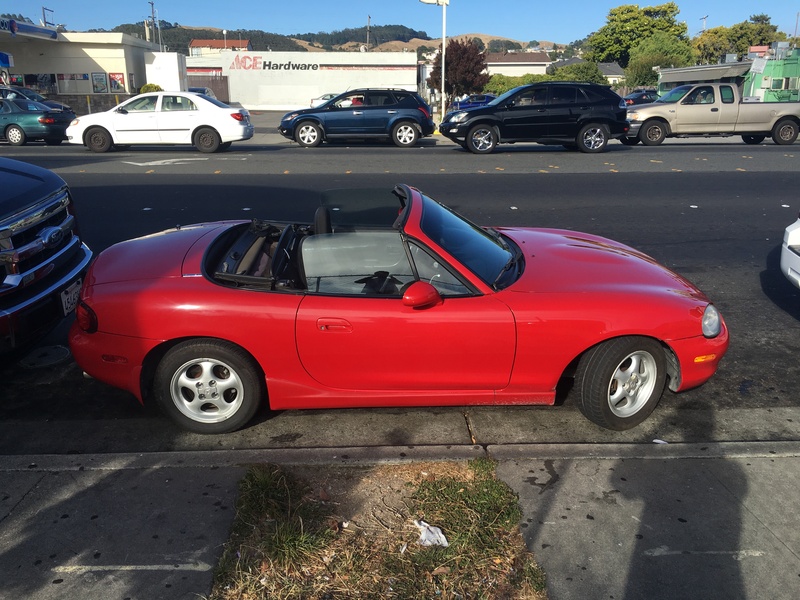 I’ll write a more in depth review about the car itself at a later date; today, however, I’m going to talk about how she performed on her first road trip. Pictured above is my bulky laptop bag, a medium sized suitcase, and my small camera bag – all the reviews for those are inbound, so I’ll come back here and link to them when I get them up. For the record, it’s totally overkill for the short duration of my trip – but it’s nice to know I can fit lots of stuff in my car. 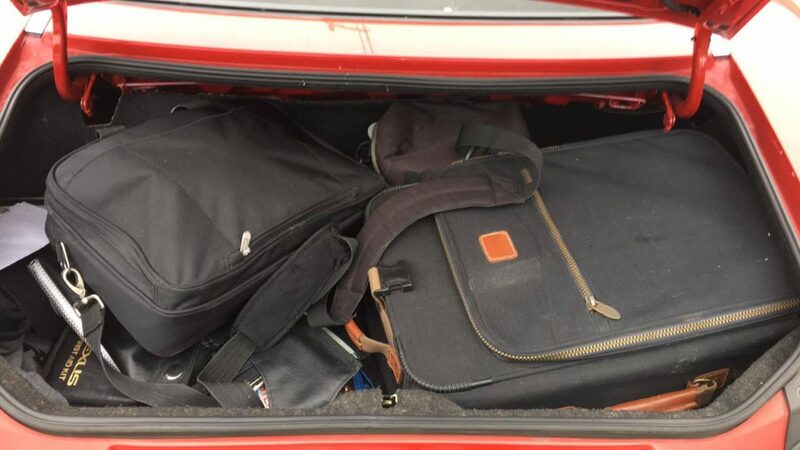 In fact, the reason why the laptop bag looks so crudely placed is that I have the softtop boot under it – which I should affix for the long trip next time! And if that’s not enough space for you, you still got the other seat (if you’re going solo), and the parcel shelf where the top is located when folded down. During my 50 mile trip one way to my conference and hotel, I found that overall, Mia here is a comfortable car to go long distance driving with; granted, with the windows and top down it can get noisy inside the cabin (to the point you’d need to yell to hear your passenger), and at around 80MPH the engine sings a mid range note because it’s humming along at 4k RPM; but, if the noise doesn’t bother you (it doesn’t bother me in the slightest), and if you’re not super tall, the car itself is quite comfortable after about an hour on the road. And of course, on the highway, there is virtually no difference in the autotragic or a manual, simply because you’re going to be cruising around at top gear 90% of the time. After the conference, I went out to eat – since I’ll get reimbursed for it; I tried out two places in the San Jose area, Psycho Donuts and the Rok Steakhouse and Grill. Starting with Psycho Donuts, walking in the shop you already know it’s not a typical donut shop; they have lots of art made by local artists on the walls, and all of it is for sale, too! Their selection consists of regular donuts with fancy names, and some really oddball donuts. Granted, I came in rather late; 18:00 hours local time, so selection was limited. So, I got two donuts from them; one raised donut with a vanilla frosting and Oreo pieces embedded into it, and a raised Strawberry flavored donut. I payed $3 for both, so $1.50 each; standard for a donut shop. To go with them, I got a small coffee for $1.75; a bit pricey for coffee, but it was pretty good, and of course, convenient. The one girl who was on staff was very kind, and the donuts themsevles were very, very good. The shop itself was quite nice with the aforementioned wall art and general cleanliness. They also have a rewards card that goes up to 8; as for what the reward is, I can’t tell you, because it makes no mention of it on the card. Now, I’m not a professional food reviewer, nor do I aim to be; I aim to give you, the reader, no BS reviews in plain English and on the topics that actually matter, so for this case, what matters is the coffee, donuts, cost, staff, selection, and appearance; I can say safely and gladly that Psycho Donuts aces all of them besides selection; I would have bought a regular cake/raised chocolate donut instead of a strawberry one had they had it, but I can accept it might be because of how late I came to the store. The Rok Steakhouse and Grill has got to be one of the more unique restaurant experiences in my life – because of the way they serve the steak. When you enter, friendly staff assist you in getting a seat quickly, and help you order your food. The party trick is how you get your steak; it comes raw, served on top of a “700 degree” (I have no way to verify the temperature, though I have no reason to disbelieve them) stone, which cooks your steak right in front of you. What you’re supposed to do is cut a bit sized piece and flip it over so you can cook the other side in seconds; I can confirm that it really does work. The entree comes with two sides; I chose mashed potatoes and steamed veggies. The mash potatoes had a nice garlic/buttery tinge to them, and went quite well with the steak; sadly, because of the donuts from earlier, I never had much chance to eat the steamed veggies, though the few bites I had were quite good. The place itself was quite pleasant, with a high end, modern style of booths and atmosphere. Of course, all of this excellence comes at a cost: the New York Steak I had, along with a fountain drink and tip, totalled me $42. Well, as they say, you do get what you pay for – if you’re willing to pay for it.